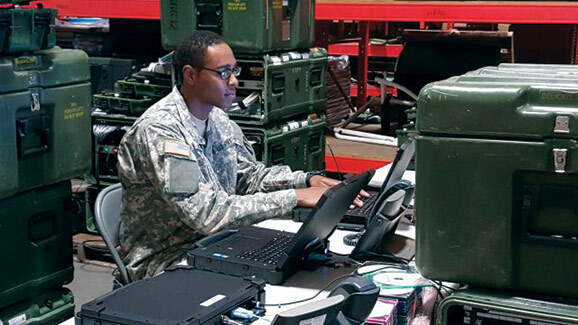 A Soldier, from the Army Reserve 392nd Expeditionary Signal Battalion, helps validate the unit’s newly enhanced Warfighter Information Network-Tactical Increment 1 network equipment on Fort Eustis, Va., Nov. 30, 2015. Photo Credit: Amy Walker, PEO C3T Public Affairs. Soldiers, from the Army Reserve 392nd Expeditionary Signal Battalion, walk past the unit’s Warfighter Information-Tactical Increment 1 Satellite Transportable Terminals on Fort Eustis, Va., Nov. 30, 2015. Going forward it will have three baselines (Alpha/Omega ‘14, Alpha/Omega ‘15, Alpha/Omega’16) with plans to continue additional new efforts into the future of the product lifecycle. These efforts are essential to ensure that the entire Army network doesn’t lose accreditation or go out of warranty at the same time, minimizing risk to the network. Having different baselines will also enable the Army to refresh equipment on different cycles as each baseline ages, instead of having to surge efforts at vastly increased costs to refresh the entire Army all at once when it nears end of life.